November 11, 1918 is a date in world history that became symbolic as the true reminder of the consequences of war. Originally known as Armistice Day, named after the signing of the declaration to end WWI, it is now known as Remembrance Day, our annual national day of mourning and remembrance. It is the day that our veteran’s voices, the living and the dead, must be heard. Make a habit each year, during our national day of Remembrance, to brush up on our Canadian Armed Forces history and visit the Veteran Affairs website. It is an excellent resource for factual snippets of information regarding Canada’s role in world conflict and gives insight into the accomplishments and defeats of the brave men and women that have served our country. We owe it to them. Lest we forget, lest we forget. An outcome of World War I, was the formation of several veteran’s associations, created as advocacy groups to ensure returning veterans and their families were properly cared for. In 1917, one of the largest of these groups, the Great War Veterans Association, was formed and Coleman followed suit with the creation of their own chapter in the early ’20’s. In November, 1925, several of these Canadian veterans groups, including GWVA, decided to unite with England’s British Empire Service League to form Canadian Legion of the British Empire Services League. Canada’s first BESL Branch was formed in Winnipeg in November, 1925, and officially chartered July, 1926. Coleman’s GWVA applied for membership to this newly united BESL soon afterward. Dues for this veteran’s only club were $3.50 per year! According to local legend, the number 9 was selected to represent each of the nine founding members. Provincial Command dispels that theory by insisting that branches were given a number in the order applications were received. It has, however, long since been verified that Coleman’s application was the first one granted a charter by Dominion Command for the province of Alberta, confirming the fact that Coleman No. 9 is the oldest Legion in the Province! Four more branches were soon chartered on October 8, 1926; Lethbridge, Vermillion, Edmonton and Strathmore. ROBERT PARRY; MM 13th Canadian Mounted Rifles, WWI, and founding member of the Coleman Legion. His wife, Marjorie, went on to become Ladies Auxiliary President and Treasurer, and they both remained active Legion members for many years. WILLIAM GRAHAM; 103 Battalion, WWI, and founding member of the Coleman Legion. He died Feb. 11, 1935, tragically, in a McGillivray Mine gas poisoning and is buried in the Coleman Union Cemetery. His son, Peter, joined the Coleman Legion from 1988-2013 and attended our 85th Anniversary. Whatever the actual story may be, our members will forever choose to believe that the number 9 does, indeed, represent our founding members! Photo taken from Crowsnest Museum shows the original store front. Livery Feed and Stable, built in 1903, burnt to the ground in 1918. That property would later be owned by Al & Margaret Krywolt, of Coleman. Mrs. Krywolt donated it to the Legion in the late 1980’s for the clubhouse expansion, in honour of her husband’s longstanding service as an Executive Member and Branch President in 1973 & ’74. In addition to working for veteran rights, another main objective described by this Legion was to save money to purchase their own clubhouse. Fundraisers were organized, in the form of penny carnivals and picnics, and were a huge success. A building was finally purchased in 1936, that was originally believed to be a warehouse and possibly a retail store, and was gradually transformed into a Legion Hall. Club members were patient, working hard over the next four years, to renovate their new gathering hall for eventual opening. The first organizational meeting to form a Ladies Auxiliary is held March, 1935. Mrs. Mary Williams was elected as President, dues are set at $1/year and a Charter was officially issued to the Coleman Ladies Auxiliary in April, 1936, to serve as a complimentary committee to the Men’s Branch. Their fundraising efforts were largely geared towards preparing and sending care packages to Coleman soldiers. The auxiliary helped organize fundraisers, and catered to branch picnics and formal dinners. Once the clubhouse was established, a kitchen area was built for them. Because ladies were not allowed upstairs in the men’s club, the women would refer jokingly to their basement kitchen facility as the ‘snake pit’ but the men knew how crucial the Ladies Auxiliary service actually was to them, and to the soldiers overseas, and would eventually overturn the ‘men only’ club policy in the ’60’s or ’70’s. This plaque is a tribute to the Coleman residents that answered the call of war, 1914-1918. It currently hangs on the Coleman Legion wall. Although erecting a cenotaph was labeled as a club objective once the clubhouse goal was realized, in the interim, this bronze plaque was made in 1931, to recognize the Coleman residents that served in the Great War. One fundraising idea came in the form of purchasing club shares at $25 per share and so an agreement was drawn up with then local employer, McGillivray Creek Coal & Coke Ltd., to garnishee wages at a rate of $1.25 per day until the $25 share price was reached. The total amount of sold shares sold is unknown today, but the Legion does have records to show that at least $700 was acquired through this effort. January 1, 1940 marked the official grand opening of the long awaited clubhouse with about 50 men in attendance. The club displayed eleven paintings, created by local artist, Mr. Fred Founds, depicting the Great War in comedic art, such as the one seen in this original piece. This painting by Fred Founders still proudly greets patrons from the foyer of the VLT Lounge of the Coleman Legion. There is rumour that another lies buried in the walls of the Legion, but several attempts to find this mystery portrait have failed. A full size snooker table is donated by Albert Sapeta, proprietor of the Grand Union. 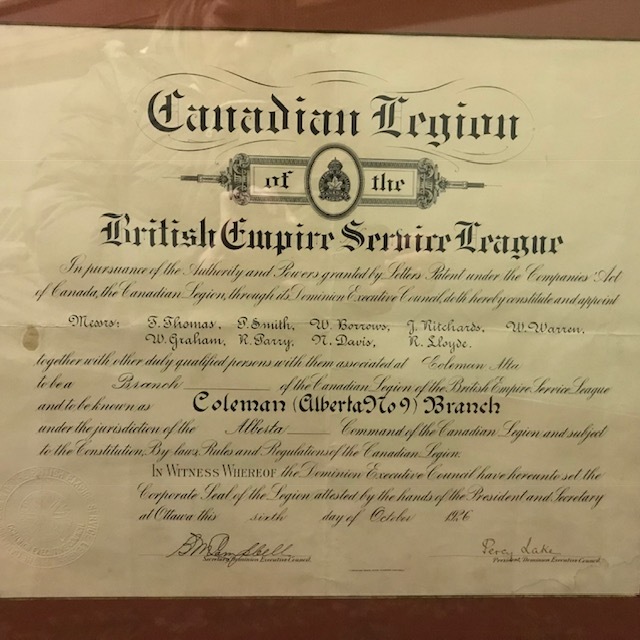 One Coleman resident, Thomas Sudworth, would join the Coleman Legion BESL on May 13, 1941, at 20 years of age, and then that very same day, went to Calgary, Mewata Barracks, were he was assigned to the Engineers. Tom returned home from the war and continued to be a Legion member until his passing in 2014. He will likely hold title for many years as Coleman Legion’s longest serving member with 73 years of service to our branch! His wife, Olga, was also a devoted member serving on the Ladies Auxiliary for several years. In Sept., 1940, the Legion started a Soldiers Overseas Comfort Fund to raise funds to send comforts such as cigarettes, fruit cake, candy and socks to our soldiers. Fred Founds designs a wooden soldier that was strategically placed outside the bank on payday to deposit coins in for this purpose. Mr. Founds would later join the Home Veterans Guard and departed after a gathering at the Legion of approximately 150 people. Like any cenotaph, a large base is built to represent an empty tomb in honour of fallen comrades whose remains lie elsewhere. Coleman’s original intention for their own monument was to recognize the brave citizens of Coleman that did not return after WWI, but sadly, the scope of this project had to be redirected to include the lives that were also lost in WWII. On Armistice Day, November 11, 1948, the cenotaph was unveiled. Chairman J. McIntyre spoke ‘We are assembled at our own Cenotaph – built by you, the people of Coleman, as a tribute of reverence and gratitude to those of our Community who have made the Supreme Sacrifice…” As quoted from’ Fields of Coal, Fields of War,’ researched and written by Rosemarie Gascoyne. Unfortunately, the world found themselves facing yet another conflict, this time in North Korea, and so the Coleman Ladies Auxiliary began packing comfort packages again, for the Korean War Soldiers. Veteran’s Clubs across Canada begin fundraising for the social concerns of the time; polio and cancer. 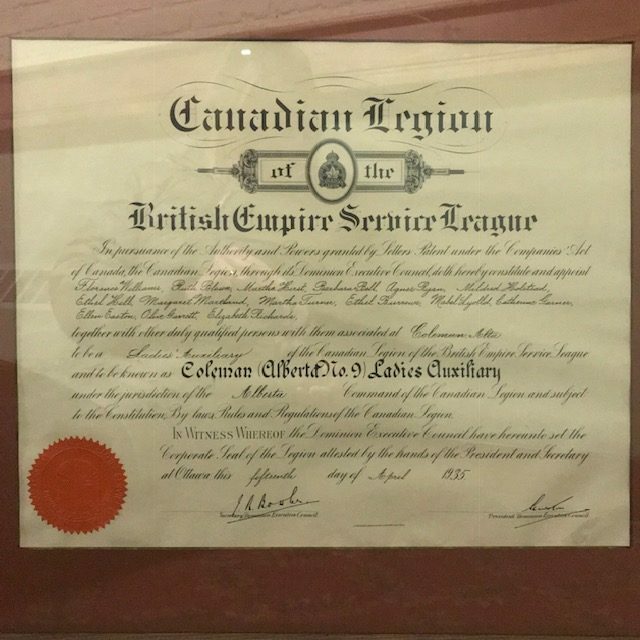 In 1960, Queen Elizabeth grants the British Empire Service League Royal status in recognition of the association’s 35 years of service and we became the ‘Royal’ Canadian Legion. The organization adopts a new crest in 1961 to reflect this change. In 1963, the Coleman Legion lost their liquor license for 2 months due to liquor violations! In 1967, thieves break into the Legion and steal the office safe, which, days later was recovered in the Crowsnest River. After several unsuccessful attempts to break into the safe, it was concluded that the thieves grew frustrated and opted to take their losses by throwing it in the river to rid themselves of the evidence. This very safe continues to protect Legion assets today! On April 23, 1976, the Coleman Legion was issued a new Charter as The Royal Canadian Legion, Coleman Branch No. 9. Chartered as The Royal Canadian Legion, Coleman Branch No. 9, on April 23, 1976. This charter is located in the Legion office. Canada, along with most of the world, was fortunate in that no major wars had broke out since Korea. In addition to the ever-important and primary role of veteran advocacy and the message of remembrance, the Coleman Legion’s role in the community began to shift towards support services; as a social gathering site, a community facility, and as a financial support system for other local non-profit groups. An old club menu, date unknown. Coleman Legion prior to 1986. With the continued success of the club, 50 years later they find themselves saving money for the clubhouse again. The land to the west of the Legion was purchased for the undocumented price of $10,000 and the architectural planning began in 1984 to build an addition of similar square footage in order to double the size of their facility. Local contractor, Gordie McQueen, was hired to duplicate the building brick work on the face of the building, and the project began in 1986. At the same time, a ‘new face’ was added to the inside. Lucille Fraser was hired, unbeknownst to her, in July, 1981. Lucille would later laugh about the manner in which she was hired; her mother applied for, and accepted the job before consulting her! Reluctantly, Lucille did accept the Legion’s (her mother’s) proposal, and remained a familiar face as bar steward and manager until her retirement in 2012. At the time of her retirement, she was awarded Life Membership for her 31 years of dedication to this Branch. This ship’s bell, donated by Ron Poulton, will be forever affixed to our wall! The Legion proved to be an after-work hot spot for many of the miner’s of the Coleman Collieries Mine. Lucille recalled lunch boxes lined up at the door, while she served refreshments to wash down the coal dust upon quitting time! It was not unusual to sell 2 boxes of pull tickets per day, as that was the only form of legal gambling in Alberta at that time. Even modern daily bar sales would not rival those of the ’80’s, due in part, by a little bell….. Upon his retirement from the Navy, Coleman resident, Ron Poulton, donated this bell to Branch No. 9, taken (with permission) from one of the ship’s that he served on. It’s inscription reads, ‘Presented to CANADIAN LEGION BRANCH #9 COLEMAN, by RON POULTON JAN. 11TH, 1981.’ But do not make the mistake of ringing the bell; this is the signal that you are buying the house a round! It was put to good use and in great fun back then! Another costly mistake that many Legion visitors have made is to wear a hat in the Legion. Although it is not an actual organizational policy, it has been tradition in most branches, including Coleman, that if you wear a hat, other than a ceremonial hat, you are given one warning to remove it as a of show respect for our fallen comrades. Upon refusal, you have two choices; leave immediately or be on the hook for a round for the house! This informal club rule was overturned by the Coleman Branch in 2014, with the exception of November 11th. Even 70 years later, the Coleman Legion had not forgotten it’s roots, and refocused their attention on the many faces from Coleman that served our country in World War I and World War II. Realizing that those veterans may too soon be gone, they worked with local author, Rosemarie Gascoyne, to publish a book in their honour, to document a lasting legacy of the veterans and the organization that they built in support of one another. After many long hours researching for this project, the book, titled ‘Fields of Coal, Fields of War,‘ would be officially unveiled with a public book signing at the Legion by Rosemarie on October 19, 1991. In 1990, Glen (Blondie) Poulton presents Margaret Krywolt with a plaque of appreciation for her generous donation of land for the Legion expansion project. Also at this time, a debate began regarding upcoming changes to Alberta Liquor Commission’s gaming policies. Alberta was about to offer Video Lottery Terminal’s to public bars and hotels, and so the moral dilemma to become a gaming venue was hotly discussed around the Coleman Legion board table. This decision was not taken lightly and the eventual decision was for successful application for VLT’s to ensure club survival, even though it meant more renovations to the club to meet with gaming standards at a time when money was scarce. New to the Legion in 1996 was a public VLT Lounge, in what was previously the pool table area. The Executive made another critical decision pertaining to gaming; to apply for gaming license to work casinos at other licensed facilities. The first casino worked in the mid ’90’s netted revenue of under $4000, but this money was badly needed, due to a country-wide recession. Gaming revenue was the new norm, and the decision to progress with the current times definitely saved our branch from possible extinction. Despite having installed an alarm system in the early ’90’s, in 1996, the Legion experiences another break in from a local career criminal, but not much is taken. The cement floor in the basements gets tiled for a more finished look of the banquet area, and the Legion bar gets a renovation. In 2003, Coleman Legion President, John Day, calls a meeting with members of the Blairmore and Bellevue Legion Executive, to pitch the idea of working together to offer a new Community Remembrance Day Service. It was thought that if this service was offered outside a Legion setting, a more community-inclusive atmosphere would be created, resulting in greater participation. CCHS was then chosen as the new venue, and as predicted, community attendance for this annual day of remembrance is in the hundreds each year, making it an annual tradition ever since! The Ladies Auxiliary begins to falter because of low membership numbers, and after several attempts to revive them, the ‘snake pit’ lies dormant and only their 1935 Charter remains, perhaps as another sign of the changing times. Dominion Command includes members of the Royal Canadian Mounted Police in their formal definition of a veteran. Video surveillance is installed as a protective measure to both club and staff members. The clubhouse gets repainted and the military showcase is moved to increase capacity of artifacts in anticipation of our 85th Anniversary celebrations.